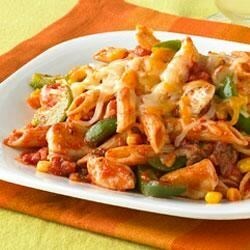 "Chunks of chicken simmered in salsa with corn and green pepper are blended with cooked penne pasta then topped with shredded Mexican-style cheese." Meanwhile, heat large nonstick skillet sprayed with cooking spray on medium-high heat. Add chicken; cook and stir 2 min. Stir in salsa, corn and peppers. Bring to boil. Simmer on medium-low heat 10 min. or until chicken is done, stirring occasionally. This was a great meal. It was simple, quick and easy. the only difference that I made was I added some onion and some garlic with the chicken. I would make this again for my family! Delicious dish. Good flavour. I had red, green, and yellow peppers so used 1/4 of each. Also used coloured rotini pasta. Easy to make, very tasty. 4 stars. Quick & easy. Used shredded pepper jack, and farafalle because its what i had on hand.... and left the corn out. Leftovers were great for lunch the next day too! Really tasty. I served blue tortilla chips as a side and my family really liked it. Wonderful, it's almost a 'one-dish' meal! Made this for dinner tonight I added green onion and garlic and left out the corn! It tasted very delicious and I've got plenty for leftovers!